Just weeks before WWDC, Apple’s yearly developer conference begins, we’ve been hearing more rumors than ever about what could possibly be unveiled. According to sources, we’ll see iOS 5, with a complete rework of the existing iOS notification system, as well as widgets. Excitement received a fairly major boost earlier this week, when Apple reportedly offered to fly British media to San Francisco in order to report on the event. The report assumes that Apple wouldn’t spend money flying journalists from across the pond unless it was up to something big, and I think they’re right: Apple has something up its sleeve, likely so major that they want all the attention they can get. A possibility would be a next-generation iPhone, although that’s not quite certain at this point, and honestly, it never was. Apple has clearly marketed this year’s WWDC as a software-only conference, at least as far as new announcements go. While its "Join us for a preview of the future of iOS and Mac OS X" description might sound vague, it’s essentially narrowing the announcement down to software. We’ll almost certainly see an announcement related to Mac OS X Lion. The operating system has been in semi-private beta stage for quite a few months, with successive seeds, the latest of which being fairly stable and nearly production-ready according to some users. Apple has promised to release Lion this summer, therefore a WWDC release announcements just makes sense. That leaves us to iOS, Apple’s mobile operating system. Back in March, when Apple announced the iPad 2, many expected to see iOS 5, similarly to what had happened in previous years. Instead, Apple rolled out a small revision, iOS 4.3.x, which included no changes, except for a few minor enhancements. Details about the future of the system have been scarce, and most of the ones we’ve seen have been pure speculation. Yet, it’s not being reported that the new operating system will have a new notification system, as well as widgets for the first time. It’s good to know that this feature might be due for an urgent upgrade. I’d like to see a way to queue up notifications, so they could be dealt with later. In addition, notifications, at least when they’re not urgent or require immediate user input, shouldn’t pop up on top of all apps and interrupt interaction like they do today. If a notification isn’t important, users should be able to just pull up a log and look at it later. As for widgets, it’s hard to predict how they’ll be implemented into the iOS interface, which is now essentially App-dominated. It could mean a real reworking of the system’s interface. 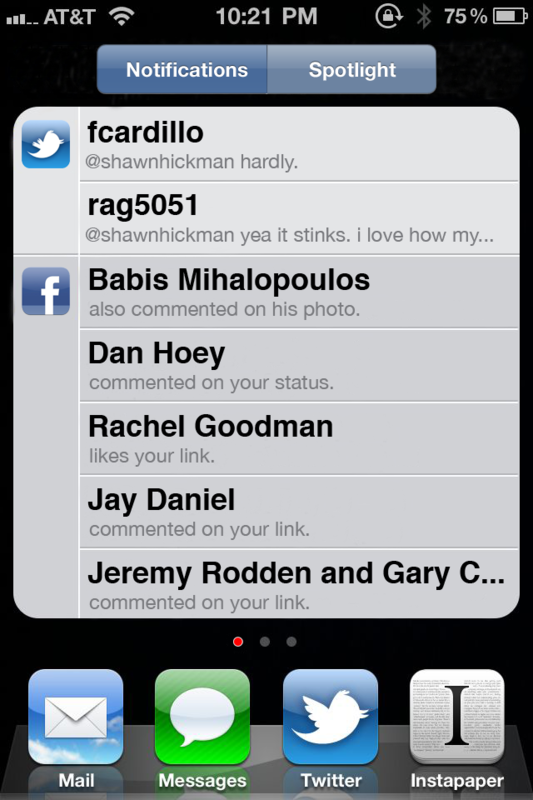 Earlier this week, we reported on a video concept that shined some light on what widgets could look like in iOS. It’s important to stress that this is pure speculation and no one can be sure until the event happens. Both iOS and the iPhone are clearly due for an upgrade, the question is whether we’ll see both announced at WWDC. Until then, let’s just keep our finger crossed and hope that the event surprises us.